Services such as text messaging (if not already included in your plan), data usage (if not already included in your plan or if you need to purchase additional data), and international long distance calls will reduce your number of minutes or Airtime Card balance to cover the cost of these ancillary services. 1-800-FREE-411 information services are included at no additional cost. The Best Cellular International Long Distance (ILD) program is similar to using a calling card, but with this program no physical card is necessary. The integrated international long distance program allows you to call friends and relatives all around the world directly from your cell phone or any other location. Your Best Cellular service can be used in the U.S., Puerto Rico and US Virgin Islands. However, your service does not allow you to roam in other countries. When traveling abroad, if you have Best Cellular service on the (GSM-A) or (GSM-T) networks and if your phone is unlocked, we recommend purchasing a local SIM card and use your phone on that wireless network. You can find your Usage Summary when you log in to your account online at thebestcellular.com. Unlimited voice services are provided for live dialogue between two individuals. Unreasonable use includes, but is not limited to, multi-party calling (separate calls initiated by you but not bridged together), reselling of service through the use of external equipment (i.e. Simbox or any other type of equipment that allows reselling of service) or by tethering Best Cellular service, monitoring services, data transmissions, transmission of broadcasts, transmission of recorded material, or other connections that do not consist of uninterrupted live dialogue between two individuals. Data service is available with qualified plans. You can log into your account online or call customer service to buy more airtime. Online payment methods include Visa, Master Card, Discover or Debit Card (must have Visa or MasterCard logo on it). If you are a current customer, log into your account at thebestcellular.com and select Current Plan Information. To view all plans, select Plans on the homepage. You may also contact customer service for plan information. No, Best Cellular does not throttle or reduce data speeds. You may pay your Best Cellular bill online by logging in to the Member Sign In portal on our homepage. Your Best Cellular account will be automatically suspended if we fail to collect the payment for a new month of service. If your plan is suspended, you will need to make a payment for the next month of service. You can do so by logging into your account at thebestcellular.com or calling Customer Care . If you do not reactivate your service within 15 days of account suspension, your account will be deactivated and phone number be lost forever. Please contact customer care to request a new SIM card from Best Cellular. Unfortunately, Best Cellular does not currently cover lost or stolen devices. If your phone has been lost or stolen, you can report it missing by calling Customer Service. Customer Service will suspend your account until you notify with either you found your device or provide a new device. At that point, your services will be restored. Note: Best Cellular is not responsible for usage if device is lost or stolen. Yes, you can bring your existing phone to Best Cellular. ✔ The RED Network (CDMA) requires an inactive RED Network CDMA phone. ✔ The BLUE Network (GSM-A) requires an unlocked GSM phone working on the 850MHz and 1,900MHz frequency bands. ✔ The PINK Network (GSM-T) requires an unlocked GSM phone working on the 1,900MHz and 1,700MHz frequency bands. Please use the "Device Eligibility" Tool located at the top of Best Cellular homepage or contact your distributor to determine eligibility. 2.) 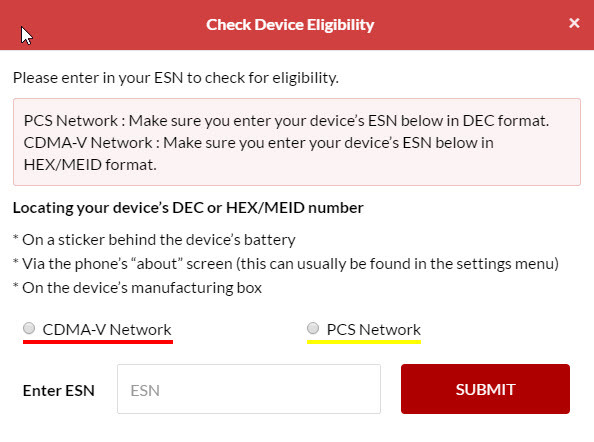 Select either the RED or YELLOW Network, enter your device's ESN, click Submit. Specific restrictions and exclusions apply. Some features of the device may not function properly when activated with Best Cellular. Please ask your distributor about any limitations. You can also contact us for help determining if your device is compatible. When a cell phone is "locked," it can only be used on the wireless carrier that sold you the phone. An unlocked cell phone can be used on any network that is compatible with the phone's wireless technology. All phones sold on Best Cellular site for the BLUE or PINK Network are unlocked. If you plan to bring your existing phone to the BLUE or PINK Network, you must make sure your phone is unlocked. If you are not sure whether or not your phone is unlocked, check with your service provider and have it unlocked prior to bringing it to Best Cellular. Go to thebestcellular.com and enter your username and password. Your username and password can be found on your original receipt in the customer information section. Yes you can port your existing number at the time of activation. Porting can take as fast as 1-2 hours or as long as 24-48 hours. Please note that you cannot port your number if you disconnect your current service before beginning the porting process. Please be advised that if you port your number you will lose service to that number on your current phone until the porting process is completed. You also have the option of activating service with a new number and then porting your previous number after you receive your new phone. This will require a new SIM card on the BLUE or PINK Network. What if I don't want service anymore? You will have service for as long as you have an active plan and anytime minutes on your account. If you do not want to continue with service simply contact Best Cellular Customer Service to cancel. If you have your account on Autopay, remember to mention this to our Customer Service Team so your account does not replenish itself your next month of service. ✔ RED (CDMA) Network: HEX ESN from your phone. You can locate the HEX ESN by looking under the battery, on the box or depending upon your device model, you can find it in the Settings option within the phone (menu prompts will vary by device). ✔ BLUE (GSM-A) Network: SIM card number and IMEI from your phone. You can find the IMEI by looking under the battery, on the box or by pressing *#06# into the dialer. The SIM card number can be found printed on the SIM card and is 20 digits long. ✔ PINK (GSM-T) Network: SIM card number and IMEI from your phone. You can find the IMEI by looking under the battery, on the box or by pressing *#06# into the dialer. The SIM card number can be found printed on the SIM card and is 19 digits long. ✔ YELLOW (PCS) Network: DEC ESN from your phone. You can locate the DEC ESN by looking under the battery, on the box or depending upon your device model, you can find it in the Settings option within the phone (menu prompts will vary by device). PCS Network : Make sure you enter your device’s ESN below in DEC format. CDMA-V Network : Make sure you enter your device’s ESN below in HEX/MEID format.